A Muslim cleric who had previously criticised Boko Haram has been shot dead with his wife and child in northern Nigeria, locals and his family said on Sunday. Unknown gunmen opened fire on Adam Albani's car at about 10:30 pm (2130 GMT) on Saturday in the city of Zaria, as he drove home from teaching a theology class. Suspicions will likely fall on Boko Haram for carrying out the shooting, as Albani, 54, had criticised the group and given his support to the Nigerian military campaign against them. His theology class was in the Tudunwada area of Zaria, where soldiers had carried out raids on two suspected militant hideouts in the past. Local resident Mohammed Usman said Albani's wife and son were hit, while the gunmen appeared to have dragged the cleric from the car and shot him at close range. "We kept hearing gunshots very close to our homes and later we heard the sound of a car retreating and when we later came to the scene we found Sheikh Albani lying outside the car with lots of bullet holes on him," he added. "He was still alive but his wife and a child she was holding in the front seat were already dead while the rest of the children sitting in the back seat were unharmed." Albani's brother Kaburu Adam said the preacher died shortly after he was admitted to hospital. The preacher had been a close ally of another prominent cleric, Jaafar Mahmud Adam, who was shot dead at his mosque in the northern city of Kano in April 2007. Zaria, which is predominantly Muslim, developed as a city in the 15th century and is one of the oldest in northern Nigeria, priding itself on a reputation as a centre for Islamic and Western scholarship. It has been less affected by violence than other parts of the north but fears grew among locals of Islamist cells operating in the city, when a French engineer escaped from his captors last November. Francis Collomp had been held for a year until he managed to slip free as his captors prayed. In March 2012 Nigerian security agents arrested the mastermind of the kidnapping of a Briton and an Italian during a raid on a hideout in Zaria. 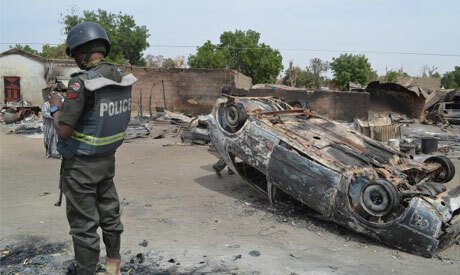 This capture led to the discovery of the hostages in the northern city of Sokoto, resulting in a botched rescue operation in which the hostages were killed. Thousands of people have been killed since 2009 in attacks blamed on Boko Haram, which want to create an Islamic state in northern Nigeria.